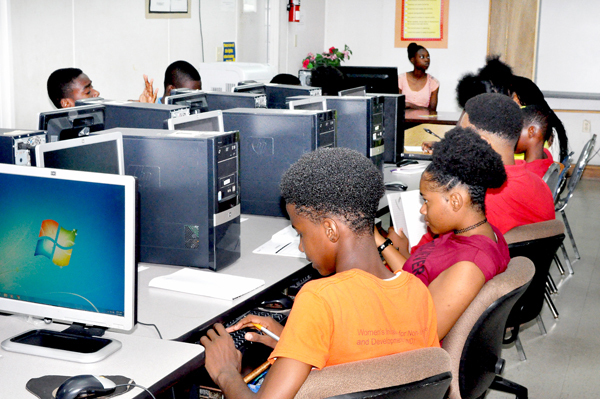 The much anticipated Information and Communications Technology (ICT) Summer Youth Program was officially launched at the Bahamas Technical and Vocational Institute (BTVI), in partnership with the Office of the Prime Minister and the Ministry of Education. Parents, students, BTVI executive management, staff and instructors gathered during the recent opening ceremony held at BTVI. 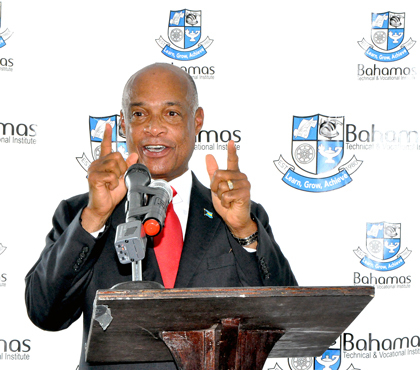 Minister of Education, the Honorable Jeffrey Lloyd urges students not to take this opportunity lightly. Keynote Speaker, Minister of Education, the Honorable Jeffrey Lloyd shared a few strong and encouraging words with the young teens. He urged them to take their futures into their own hands and to rise above their circumstances and environments so that they can take full advantage of this opportunity. “You are among the first generation that’s going to have a different opportunity... Through training, through mentorship, through education, through opportunities like this, [this program] is going to engender a new culture in The Bahamas. It’s a culture called innovation,” said Minister Lloyd. Meanwhile, BTVI Chair of Information Technology, Anthony Ramtulla informed the students of the many opportunities available to them through this innovative program. “With this program, the seed will be planted for these young people to become the leading experts in Software Engineering, Network Engineering, and Information Technology Management in the nation,” said Mr. Ramtulla. 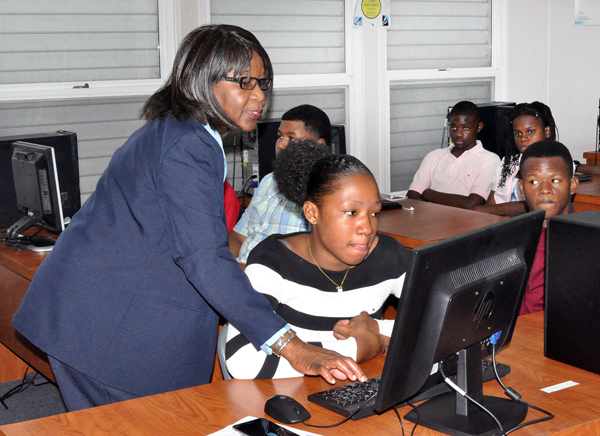 Students dive into technology with the help of BTVI instructor, Tiona Tomlinson. Two young teens in particular are extremely excited about being a part of this summer program. Alexandria Herard joined this program with her lifetime goal in mind. For her, this is not just another summer program. “I was looking for something productive to do over the summer and I heard about this program. It seems to have some great benefits, especially the international certifications. I have dreams of opening my own pediatric hospital that will use technology to allow patients with challenges to communicate. This program is a step towards my dreams,” said the 14-year-old D. W. Davis student. Meanwhile, her friend, 14-year-old K’Shaun Stubbs is adamant about not getting left behind in a technologically advancing world. “The world is becoming electronic and we as young people have to keep up with the pace... I joined this program to expand my knowledge of information technology so that I will be able to apply it to my future,” said the Mount Carmel student. Participating in this program will give these young teens a head start in their future careers in the information technology field. 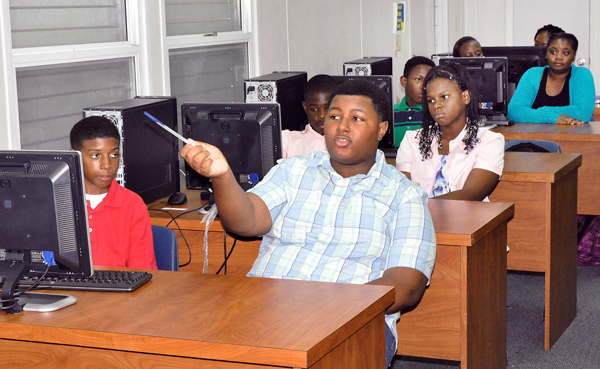 There are 126 students presently enrolled in the program in New Providence. It is also being offered at BTVI’s Grand Bahama campus. Left to right: BTVI President, Dr. Robert W. Robertson; Minister of Education, the Honorable Jeffrey Lloyd; BTVI Chairman, Kevin Basden and BTVI Chair of Information Technology, Anthony Ramtulla. 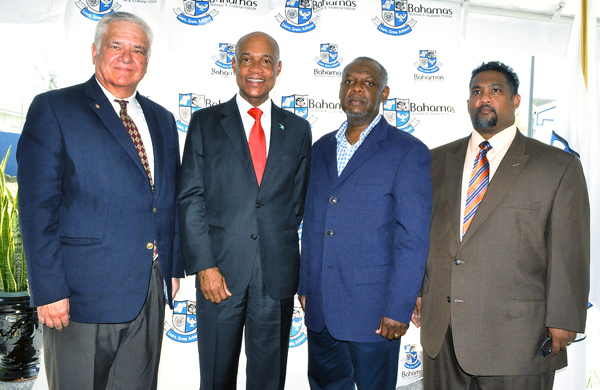 BTVI President, Dr. Robert W. Robertson stated that this training will assist in bridging the skills gap in The Bahamas and in developing Freeport as a knowledge based centre in the region. 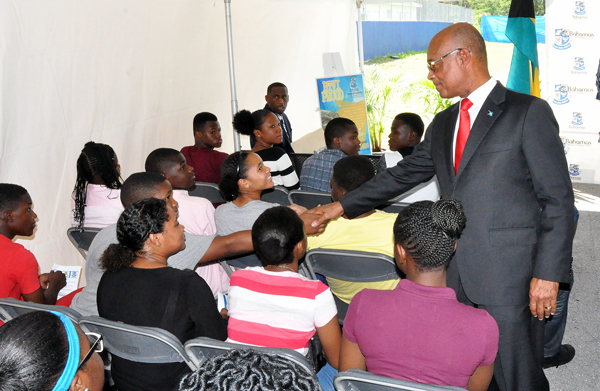 “BTVI wishes the members of the first cohort of the ICT program much success as they take this first step towards achieving their future goals” noted Robertson. BTVI will be receiving the award from CompTIA for being the outstanding academic partner for the Caribbean and Latin America. Minister Lloyd greets and chats with ICT program participants.